Over the weekend Adrian Wojnarowski at Yahoo Sports rocked Philadunkia nation and set Twitter on fire with the news that League sources had informed him that Joel Embiid had “suffered a setback in the healing process of his right foot”. Needles to say Woj’s report casue a great deal of concern among the 76ers’ fan base. Obviously there is significant reason for concern about the long term health of Embiid’s foot and the impact the lingering injury could have on his career here in Philadelphia. However, the immediate concern for us here at Philadunkia is what kind of impact will the Embiid news have on Hinkie’s strategy for the 2015 NBA Draft. After the jump C. Smith and Jeff McMenamin examine that specific angle of the Embiid news. 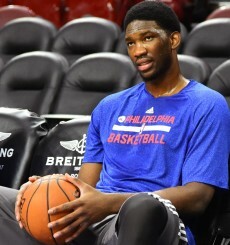 C. Smith: First, let me say that I am NOT pressing the panic button on the Embiid injury front just yet. The fact that his right foot is healing slower than expected is a concern to me, but it certainly is not devastating news. I’ll be honest and tell you that I did not want Embiid playing in the NBA Summer League (Las Vegas Baby!) anyhow. That summer run is filled with the Matthew Dellavedova’s of the world who are trying to make a roster by diving all over the place and playing with reckless abandon. The last thing I wanted is one of those journeymen/12th man types landing on Embiid’s foot and sending him to the IR for the year (again). Now with regards to the report on Embiid’s foot and its impact of Hinkie’s plan for Draft15, I am of the opinion that the Embiid news will have no impact on Hinkie’s strategy for the night of June 25th. Here’s why…The majority of online experts I read and NBA front office people I talk/text with are predicting that Towns and Okafor are the best prospects in this Draft and will be the first two players selected (the order depends on who you read or talk/text with). That idea will not change because Embiid is not healing as fast as 76ers management and fans would like. Additionally, the two names I see/hear most associated with the 76ers at No. 3 in this Draft are Russell and Porzingis (FYI…the Porzingis momentum right now is amazing). There seems to be a significant drop from those four “top prospects” to the next group — Cauley-Stein; Winslow; Mudiay and Hezonja. Therefore selecting a player from this second group of prospects at No. 3 would be viewed as a significant gamble whether Embiid was struggling to heal or not. I also do not think the news on Embiid’s foot will cause Hinkie to trade up to get Towns or Okafor as a “replacement” for Embiid. In short, this news does NOT change Hinkie’s plans for Draft night 2015. Hinkie will select the best available prospect at No. 3, so it’s still Russell or Porzingis for the 76ers. Unless of course Towns/Okafor somehow slips to No. 3, then all bets are off. Jeff McMenamin: Would this change my draft strategy? Yes. Will this change the Sixers’ draft strategy? I’m not sure. To me, this news on Embiid can’t be anything the team didn’t already know. Although, maybe the Sixers wanted to double-check the foot leading up to the draft, just in case a disaster scenario (like further surgery) arose. Nobody knows the real answer for sure except the ones in charge, and my belief is that they simply just took the proper precautions leading up to the draft or left no stone unturned if you will. The news is troubling, but if Jeff Skversy’s Tweet is indeed correct, not the end of the world. The bone in Embiid’s right foot hasn’t healed to where the team has wanted it to up to this point, but the Sixers have no obligation to playing him in summer league in Las Vegas next month. You can potentially rest him until preaseason, starting on October 3rd, if that’s indeed how much more time Embiid’s bone needs to heal. But, I’m also not as optimistic as most Hinkie followers. When I see Tweets like this and think back to past examples of center’s with the same injury such as Yao Ming, Sam Bowie, Zydrunas llgauskas and Bill Walton, I can’t help but be nervous about Embiid’s future. This is why for me, you really examine all possible options with the latest news, but there’s no reason to believe the Sixers haven’t been doing this all along anyway. Kristaps Porzingis is the guy I think whose stock rises the highest in the wake of the Embiid setback, and Sam got a close look at the talented 7-foot-1 Latvian on Friday in Las Vegas. Porzingis brings exactly to the team what Embiid was supposed to – the size of a center with the shooting ability of a shooting guard. Embiid far and away is a better post player and physical presence up to this point, but Porzingis is already drawing Dirk-like comparisons and could develop into one of the most talented big men the NBA has ever had with a ramped up strength and conditioning regimen. Did DraftExpress.com know something we didn’t know when they slotted Porzingis to the Sixers at No. 3 last week? Isn’t it in any way suspicious that the reports came out on Embiid the day after Hinkie saw Porzingis workout in person? In any rate, this Embiid news, coupled with point guard D’Angelo Russell’s apparent illness, which kept him out of a Sixers workout over the weekend, makes Porzingis an interesting play for the Sixers at No. 3 and one that is more justifiable for Hinkie than it was a week ago. In my mind, Porzingis is now just slightly behind Russell as far as the draft is concerned, just strictly based on the fact that I’m holding out hope for Embiid’s eventual recovery. If Karl Anthony-Towns falls to the Sixers, fantastic. Draft him in a heartbeat. But between Porzingis, Jahlil Okafor, Emmanuel Mudiay, Justice Winslow, Mario Hezonja and Willie Cauley-Stein, I think Porzingis now gets the slight nod in terms of team need and fit. C. Smith is the Editor of Philadunkia.com. You can follow us on Twitter @philadunkia.